2x4 joined Miuccia Prada and curator Germano Celant in creating “Post Zang Tumb Tuuum. Art Life Politics: Italia 1918-1943,” a 2018 exhibition held at Fondazione Prada. The institution’s largest exhibition to date — comprising over 600 works and over 800 supporting documents across five buildings — “Post Zang Tumb Tuuum” tracks developments in Italian art vis-à-vis the burgeoning Fascist movement. 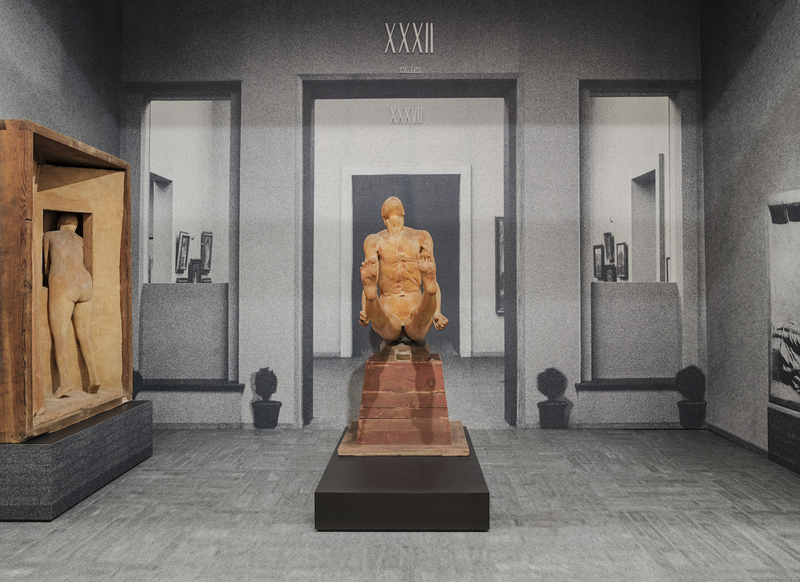 Tasked with overall branding, advertising, exhibition design, and catalogue, 2x4 worked closely with Celant and Fondazione Prada’s research team to craft an immersive contextual approach to the extensive historical artifacts and archival objects. The design embeds artworks within the show’s twenty-five-year timeline: art is displayed in the chronology of documentary photographs and supporting documents, reflecting dates of initial exhibition and reception rather than creation. The work is further contextualized through a series of full-scale reconstructions of historical exhibitions, recreated using period photographs, as well as an installation featuring a series of life-size projected images from Mussolini’s 1932 Mostra della Rivoluzione Fascista [Exhibition of the Fascist Revolution]. Thematic focuses dedicated to contemporary politicians and thinkers give a sense for the era’s intellectual ferment. “Post Zang Tumb Tuuum” opened to widespread critical acclaim, and was favorably reviewed in both Italian and international outlets, including Il Manifesto, Wallpaper*, Domus, Art Newspaper, and The New York Times. All photos courtesy of Fondazione Prada, Delfino Sisto Legnani, and Marco Cappelletti unless otherwise noted. Exhibition design and branding for exhibition of exhibitions. Original artwork presented in full-scale reproductions of historical exhibitions. Galleria Nazionale Roma 1938. Courtesy of Rome's National Gallery of Modern Art. Life-size projections of the 1932 Mostra della Revoluzione Fascista. Timeline supergraphic chronicling key events from 1918–1943. Catalogue containing historical and new texts, artworks, photography, artifacts, and exhibition notes.